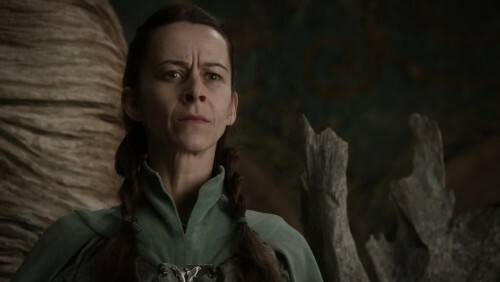 The younger of Lord Tully’s two daughters, Lysa was pretty and full of hope as young woman, when she was wed to the much older Lord Jon Arryn to seal an alliance against the Targaryens during Robert’s rebellion. Her hopes came to nothing, as she had multiple miscarriages and found life with the elderly Lord Arryn—old enough to be her grandfather—difficult. She did finally have one child, the sickly boy Robin Arryn. Her crowning glory is her auburn hair, which she keeps long, but she has grown stout and florid over the years and through her disappointments. She has a flightly and perhaps paranoid disposition, rarely able to keep her emotions in check. The actress cast for the role is 6-8 years older than Lysa as described in the books. More notably, she is certainly slimmer. Her son’s name has been changed from Robert (in honor of the king, who was fostered by Lord Arryn) to Robin, to reduce the chance for viewer confusion.